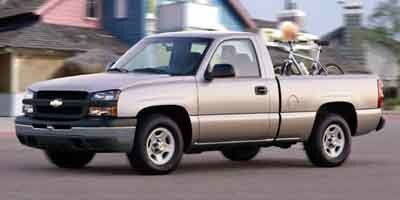 Description Look at this 2003 Chevrolet Silverado 1500 LS. Its Automatic transmission and Gas V8 5.3L/325 engine will keep you going. This Chevrolet Silverado 1500 comes equipped with these options: WHEELS, 4-16" X 7" (40.6 CM X 17.8 CM) BRUSHED ALUMINUM -inc: center caps & steel spare, TRANSMISSION, 4-SPEED AUTOMATIC, ELECTRONICALLY CONTROLLED W/OVERDRIVE & TOW/HAUL MODE, TRANSFER CASE, ELECTRONIC AUTOTRAC -inc: push-button controls, TRAILERING EQUIPMENT, HEAVY-DUTY -inc: trailering hitch platform, 7-wire harness (harness inc: wires for: park lamps, backup lamps, right turn, left turn, electric brake lead, battery & ground) w/independent fused trailering circuits mated to a 7-way sealed connector. Also inc: (K47) Air cleaner, high capacity., TIRES, P265/75R16, ALL-TERRAIN, WHITE OUTLINED-LETTER, SUSPENSION PACKAGE, OFF-ROAD -inc: 1.81" (46 mm) shocks, off-road jounce bumpers, stabilizer bars, Skid Plate Package, Air cleaner, high capacity & Z71 decals on rear quarters, SPARE TIRE LOCK keyed cylinder lock that utilizes same key as ignition & door, SKID PLATE PACKAGE -inc: aluminum front underbody shield starting behind front bumper & running to 1st cross-member, protecting front underbody, oil pan, differential case & transfer case, frame-mounted shields, SEATS, FRONT CUSTOM CLOTH 40/20/40 SPLIT-BENCH, 3-PASSENGER, DRIVER & PASSENGER MANUAL RECLINING, CENTER FOLD-DOWN ARMREST W/ STORAGE & ADJUSTABLE OUTBOARD HEAD RESTRAINTS & STORAGE POCKETS (STD), and REAR AXLE, 3.73 RATIO.